Heat sesame (or peanut) oil in a wok or large skillet over medium-high heat. Stir in the garlic, and cook until the edges begin to brown, about 20 seconds. Add the green beans; cook and stir until the green beans begin to soften, about 10 minutes. Stir in the sugar, oyster sauce and soy sauce. Turn down the heat slightly and continue cooking and stirring for several minutes until the beans have attained the desired degree of tenderness. 443 members have added this recipe to their cookbook. mmmmmmmmmm totally delish!! although i didnt add that much sugar and popped a little more soy in and added cayenne pepper lovelyy dish actually tastes like uts from the Chinese very tasty!! Have also used this same recipe with broccoli and aspargas with mushrooms and they both turn out great. Spicy green beans and shrimp with lime. 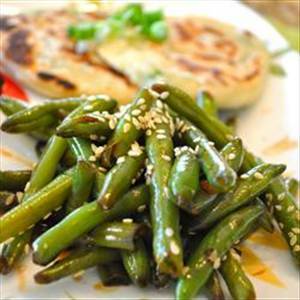 There are 54 calories in 1 serving of Chinese Style Green Beans in Garlic Sauce.